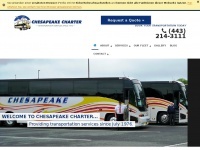 Chesapeake Charter, Inc. is uniquely suited to serve all your transportation needs. From school trips, sports teams, wedding shuttles, church outings, local and long distance tours and everything in between. A profile of Chesapeakecharter.net was found on the social network Facebook. The web server used by Chesapeakecharter.net is located in Ashburn, USA and is run by RagingWire Data Centers. This web server runs 1 other websites, their language is mostly english. The Chesapeakecharter.net websites were developed using the programming language PHP and served by a Microsoft-IIS server. The website uses the latest markup standard HTML 5. The website does not specify details about the inclusion of its content in search engines. For this reason the content will be included by search engines.